Choosing to stay home for college has opened doors to the world for Psychology major Garrett Stone. Full Name: Garrett Steve Stone. High School: Tattnall Square Academy, where he participated in the marching band, drama, and studying and teaching classical ballroom dancing. Family: Mother and father, Steve and Phyllis, older sister, Elizabeth, and 12-year-old niece, Livia. Employment: "I am lucky enough to be a full-time student, as long as I take out the trash, empty the dishwasher, and take care of the chickens." Activities: Experiential Learning and Psychology Club. 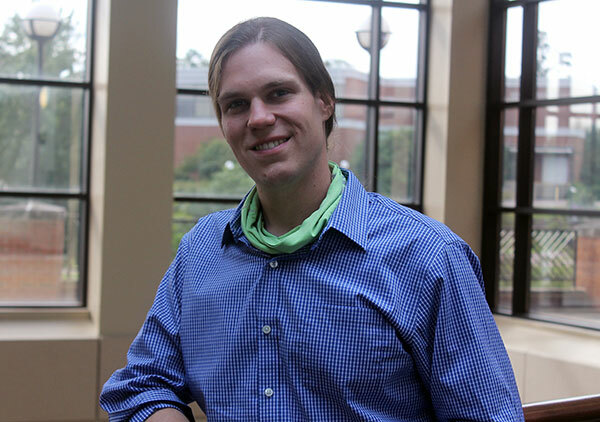 Career Goals: "I am on track to enter a master's program to become a mental health counselor. I have been given so much in life that I would like to spend the rest of it giving back. If I feel led to explore other career options I can guarantee that I will find a way to enrich the lives of others using the skillset I have acquired at MGA." He chose Middle Georgia State University because … "Honestly, it was really quite simple. My parents sat me down one day to explain the true cost of studying away from home, and I opted for the local state school to be near my loved ones. This allowed me to stay at home, work part-time at the family business, and attend college all at once. I had no prior knowledge of MGA whatsoever." The greatest thing he discovered about Middle Georgia State was … "The variety of fields of study available. Like many new college students, when I chose my initial intended major I had no idea what I was doing. Three semesters in, I stepped away from a major in Business Management to pursue a career in marketing and design. During this time, I became fascinated with the psychological aspects of marketing. Feeling that I had learned all that I would have liked about the field of marketing, I returned to Middle Georgia State to pursue a degree in Psychology. The professors have been nothing but brilliant and kind. The opportunity to work with passionate educators, regardless the subject matter, has been essential to my personal development. I aspire to be a lifelong learner, and MGA suits that desire perfectly. I'm seriously considering MGA's flight program for the future." His greatest academic experience so far as a Middle Georgia State student has been … Experiential Learning is the bomb diggity. It is easy to lose sight of the forest for the trees in that the classes one is required to take may sometime seem to lack real world application. Experiential Learning gave me the opportunity to apply the knowledge I have acquired to an ongoing initiative. In spring 2017 I had the opportunity to administer a survey that coincided with my Psychological Testing course. Not until I was in the rushes of scientific enquiry did I fully appreciate what I was learning in class. Furthermore, Experiential Learning has offered opportunities for travel via its Knights Impact program. Thirty other students and I spent a week in the Dominican Republic helping locals solve issues related to economic opportunity, health, and wellness. These experiences have permanently altered my perception of reality in the best way possible. I encourage every student to participate if possible." To him, “greatness” means … "The mastery of self along with the pursuit of selflessness. Great individuals ask not what the world can do for them, but what they can do for the world. I strive every day to give all I can to the people that depend on me. No gift given in the right spirit, at the right time, to the right person is too small." In five years … "One unexpected side effect of staying near my family for school is an insatiable wanderlust. I plan to do some celebratory traveling. Thailand, Costa Rica, and Guatemala are prospects. If I can find some passionate hikers to accompany me, I would very much like to through hike the Pacific Crest Trail that runs from Baja California to British Columbia. "Professionally, I would like to seek new opportunities in employment before I move on to a master's program. This would allow me to learn new skills while gathering resources in preparation of graduate school. I hope to attend Naropa University outside of Boulder, Colorado, to pursue a master's in Contemplative Psychotherapy or Transpersonal Wilderness Therapy."